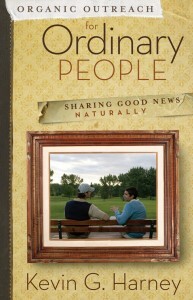 In Organic Outreach for Ordinary People: Sharing Good News Naturally, author Kevin Harney sets out to show us a way that ordinary people can do evangelism. Questions for personal and group reflection. Here is how he answers that by defining his terms. It’s organic – “living the kind of life that naturally draws people to Jesus.” This involves speaking and revealing the presence of a loving God and loving people in a genuine way. It is outreach – where people live and communicate their faith in a way that lets people know there is a God who loves them and sent his only Son to open the door to a restored and wonderful relationship with them. It is for ordinary people – everyone, including those who find personal evangelism intimidating or scary. appreciate the easy read and renewed passion you’ll feel for sharing your faith. The book has study questions and accountability questions for use in small groups and I think this is where it’s strength is – small group material for beginners. I think the most important contribution he makes to the discussion on evangelism is in Chapter 4, entitled the 1 degree rule. What is the level of passion that burns in your heart for those who don’t know Christ? Here is a video to explain it. He refers to a the Christian’s personal evangelistic temperature – can be hot, colde, or somewhere in between, but the Christian witness has the responsibility to keep it hot. The issue is not the current number, but the effort you make to raise it by one degree. Regular Personal Testimony – stories of Changed lives. I’ve taught a similar principle in my workshops, and have written about this area before. It’s refreshing to see it spelled out in a book in a simple manner like what he’s done here. Thanks, Chris. Good thoughts here. As to prayers for non-believers, I am always shocked when I ask people to name some people that are non-believers that we can pray for and there is silence. This shows that non-believers are nowhere on their hearts or minds. And since they obviously know non-believers, the fact that the still do not name them and let us pray for them shows that they do not want to open their hearts towards them. I must say, this is difficult for me to understand. I have written a few articles on how to do such a thing, and like you, I see the difficulty many people have in coming up with a few names. * One has been Christian for so long, they don’t have regular life relationships with non-Christians. * Lack of recent evangelism illustrations from pastors. * Lack of prayer in this vein. Part of why I’m writing a 30 days of prayer for the harvest series as time permits. . . . I’m about half way through. I see the harvest in my city. I’m asking the Lord of the Harvest to raise up more workers who see it.